Vibrant Exhaust Fabrication - High Flow Catalytic Converters UNIVERSAL - Pann Auto Performance - San Diego largest aftermarket automotive performance parts - What do you drive? Metal Monolith is much more resistant to the effects of vibration than traditional ceramic bricks. Capable of withstanding higher operating temperatures. 300 cell per Sq. Inch catalyst flows at 578 CFM, up to 40% better than a typical ceramic core converter. 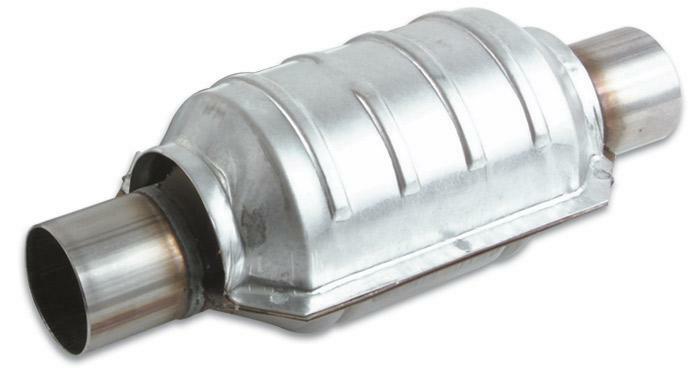 Aftermarket catalytic converters are only permitted if your vehicle does not have a converter or if a government emissions testing program has determined that the existing converter needs replacement. It is prohibited by law in the United States and Canada to remove a properly functioning factory catalytic converter.